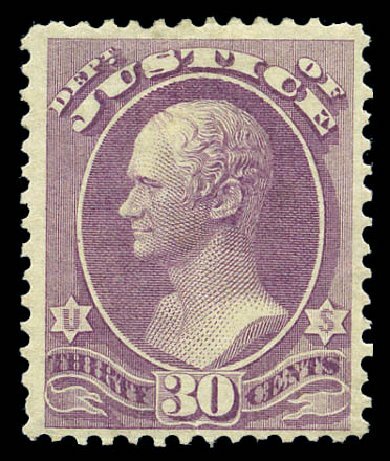 Justice Dept., 1873, 30¢ purple (Scott O33), expertly regummed, exceedingly fresh example with clear impression, looks o.g. at first glance, Fine. 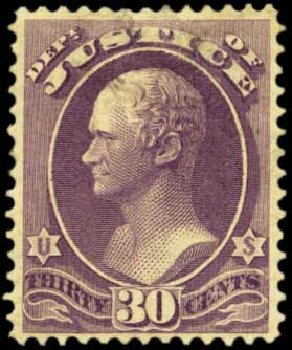 Scott $550. Estimate price $200 – 300. 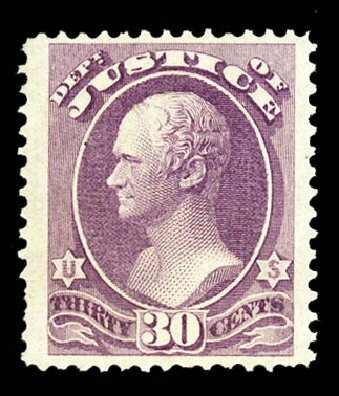 Justice Dept., 1873, 30¢ purple (Scott O33), o.g., heavy hinge remnants, extremely attractive example of this scarce and undervalued stamp, with luscious rich color, Fine to Very Fine. 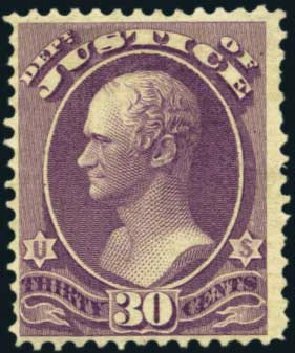 Scott $1,300. Estimate value $500 – 750. 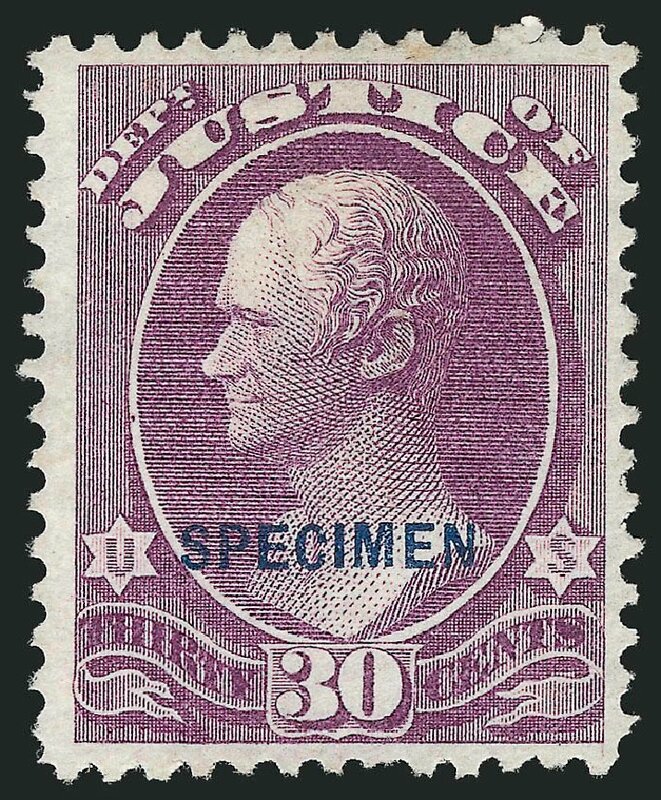 Justice Dept., 1873, 30¢ purple (O33), o.g., hinge remnants, sound, fault free example of this rare stamp, with brilliant fresh color, Fine. 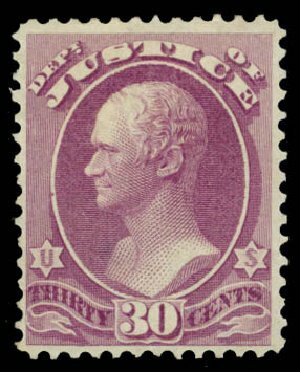 Scott $1,300. Estimate value $350 – 500. 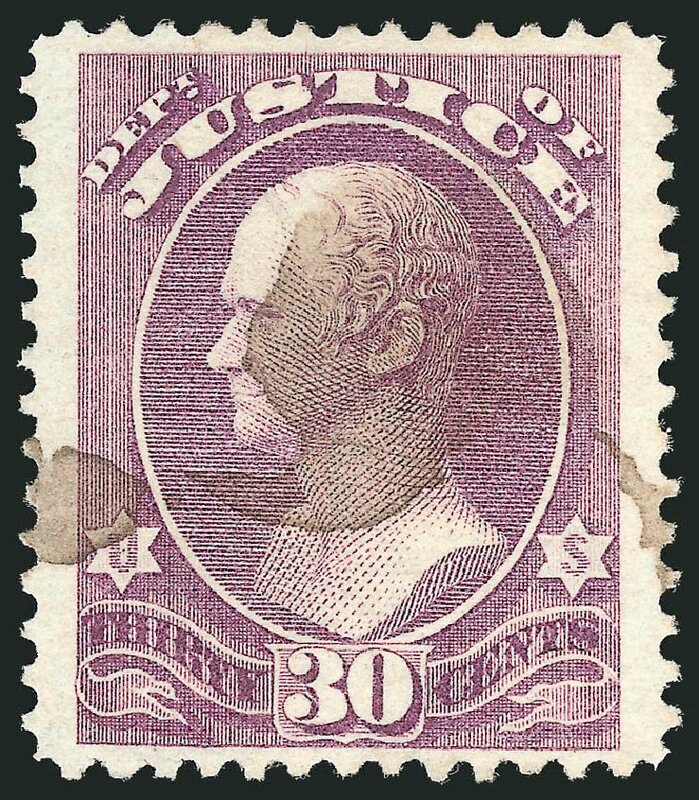 Justice Dept., 1873, 30¢ purple (O33), desirable purple cancellation, lovely example with lovely color, quite a pleasing used stamp; trivial internal crease of little consequence, otherwise Fine to Very Fine. 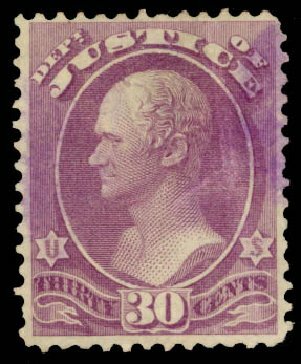 Scott $360. Estimate value $200 – 300. 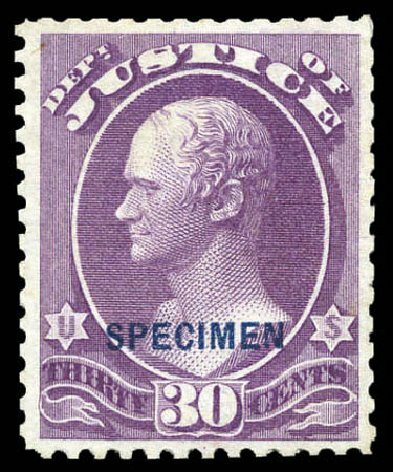 Justice Dept., 1875 Special Printing, 30¢ purple, overprinted “Specimen” (O33SD), without gum as issued, extremely handsome 30 cent Justice, only 150 sold, with iridescent color and impression, a very pretty stamp, Fine to Very Fine, 2013 P.F. certificate. Scott $1,250. Estimate price $600 – 800. 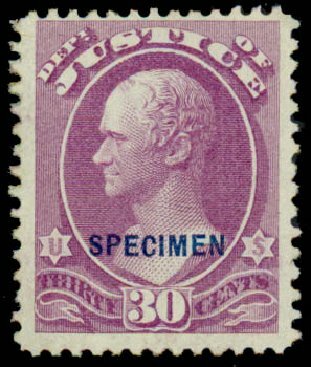 () U.S.; Official, Justice Dept., 1873, 30¢ Purple, #O33, unused, Fine to Very Fine. 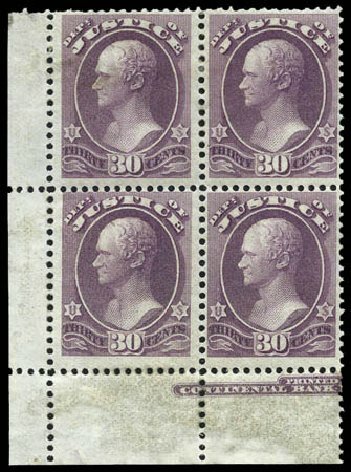 Scott $550. Estimate value $100-120. 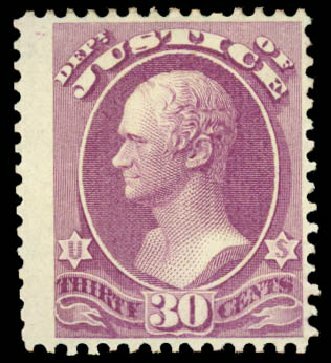 U.S.; Official, Justice Dept., 1873, 30¢ Purple, #O33. O.g., “reperfed at top”, fresh and Fine, PSAG (2011) cert. 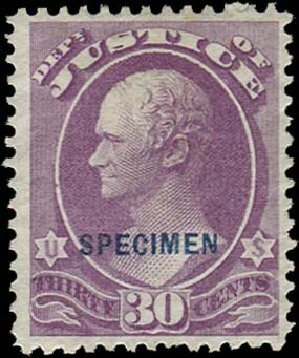 Scott $1,300. Estimate $250-300. 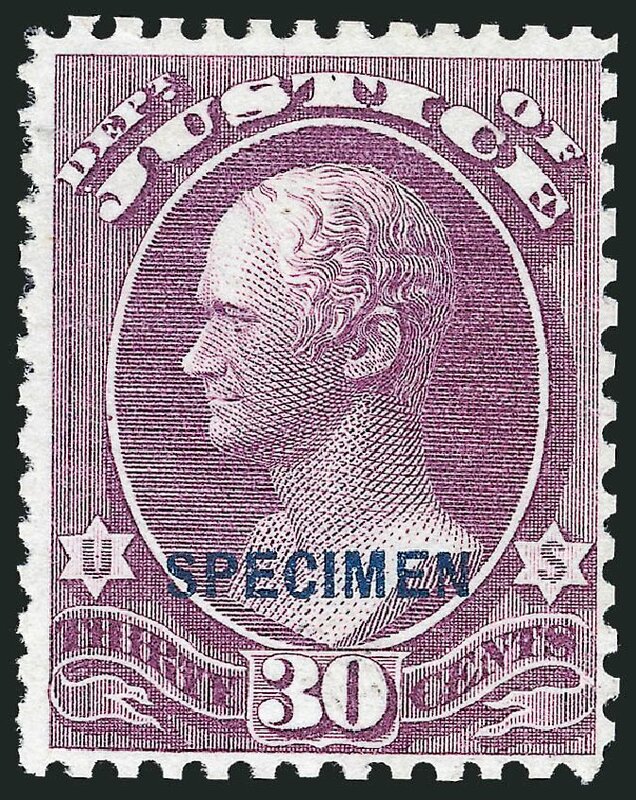 Justice Dept., 1873, 30¢ purple (O33), lower left corner margin block of four with part imprint, large part o.g., slight double transfer visible in the top frame line of the bottom stamps, light gum soak, mostly in bottom selvedge, Fine and unique. 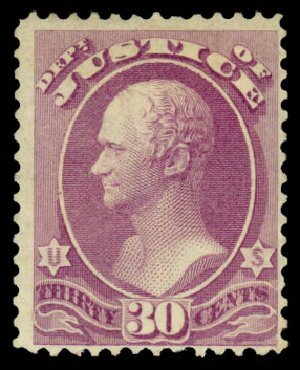 Scott $5,500 THE ONLY RECORDED BLOCK OF THE 30¢ JUSTICE. Provenance: Lockyear.